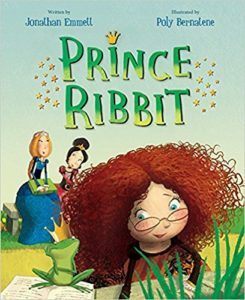 Full of twists and turns, this cute new fairy tale pulls in elements from the classic frog prince without copying. When two of three princesses embrace the original frog prince story as fact, the third princess tries to convince them that you can’t believe everything you read. Instead, they adopt a talking frog and try to kiss and pamper him into princehood. He lives a life of luxury but remains a frog. A surprise ending should delight any reader. The illustrator deftly complements the text with a sassy curly-headed redhead, clever and expressive frog and dog, a lush backgrounds, and a cast of other characters. Parents and teachers will want to read this aloud and talk about all the other ways this story and the original one could end. Kids could learn a lot about literature and about ways in which we gather facts. This book is sure to become a bedtime favorite.